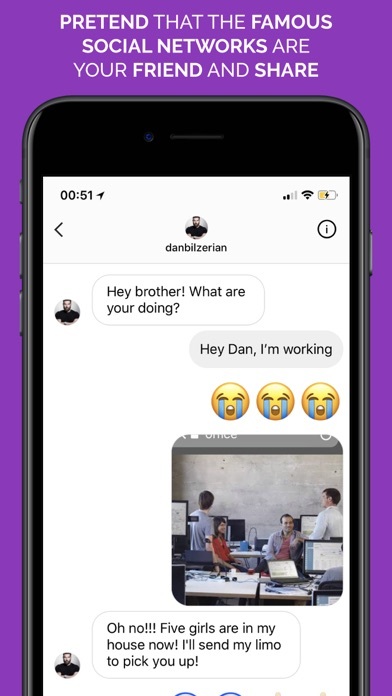 Now you can pretend, create, or edit fake and lying conversations and directs for your friends! 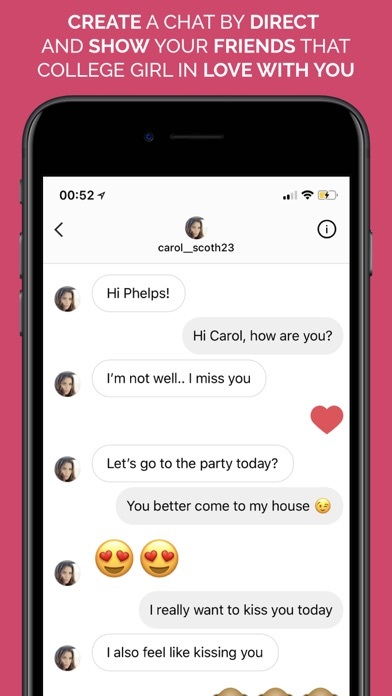 With InstaFake Prank you can simulate as if you were talking to someone on direct urge. It is very easy to create a conversation that is identical to a real conversation. Trolling is guaranteed! 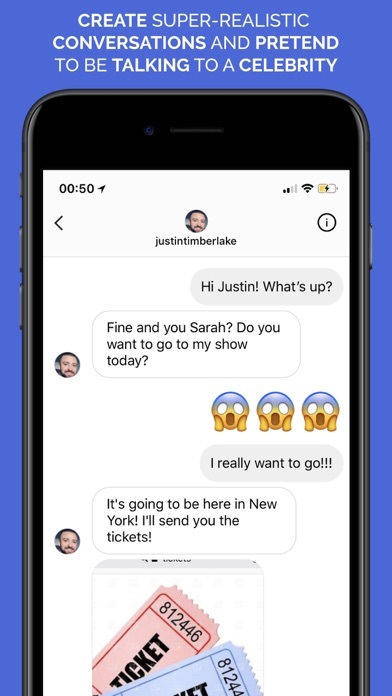 - You can create conversations with the person you want, including celebrities you do not even know. - You can create prints and screenshots that are similar to Insta. - You can control both sides of the conversation. 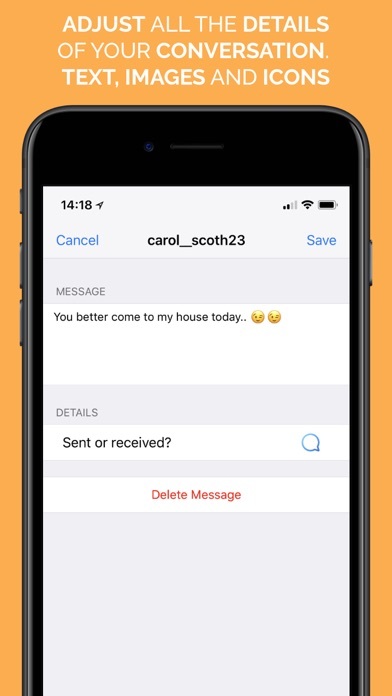 - You can simulate the sending of images and emoji. - You can change the status of Displayed or not. Disclaimer: This app is not affiliated in any way with Instagram Inc. Its made for entertainment purposes only. This app is great it can literally fool anyone. You’ll love it!!!! It’s the best social prank app ever!!! Pay the 4 bucks because if u don’t why’ll your playing on the app it’ll say how are you enjoying social app??? So get it it’s worth it. it’s pretty realistic but there’s sooo many ads like every 2 seconds and can you add an option if the person should be verified or not?? It’s honestly a really good app to use. All you need to add now Is the “verified” symbol and the video chat thing. Other than that I’d totally use it. Every time I write something it always kicks me out. Then I lose my progress. It really makes me mad. Also, WHY 👏🏻 SO 👏🏻 MANY 👏🏻 ADS?!?!?! Yeah after I finish writing this, I’m going to delete this app! This app is trash. It isn’t up to date with what the conversations on Instagram looks like. Also on top of that I accidentally payed 5 dollars that I didn’t even want to spend at all!!! I want a refund but don’t know how to get one. Help! This app is so realistic. I’ve pranked so many friends with this. It’s so fun. I only have one suggestion. Once I tried to prank my friend but she realized that the person I was “talking” to was a verified account and that in the app it didn’t show it was a verified account. If you could have a button that said “verified account?” That would be great. Thank you! I don’t understand why ads pop up every 5 seconds and you have to pay $5 for the WATERMARK. First and worst review. How do you get rid of the sticker at the top ? When I played first it was smooth but once I got out to check something I tried to go back in a chat and it just kept on popping me out! Got charged $5 to remove ads even though I never authorized it. But... when you make a text they have a sticker at the top that says “made with so and so” so go on snapchat or real Instagram get the white marker and you can cover the watermark without paying $2 to get rid of it!! I want to give it a 0 star but sadly you can’t as soon as I started writing there was an ad and then ever minute there was another there is a huge water mark that cost 5 dollars to remove and it’s the worst app ever DELETED. This was great at first but as soon as you reach 300 messages it deletes ALL OF YOUR CHATS. Which it won't take long for 300. I WANT TO RATE THIS 0 STARS BUT YOU CANT POST WITH OUT STARS. I have never wrote a bad review, but this is my first. DO NOT WAIST ANY TIME ON THIS APP. YOU WILL ONLY END UP MAD. LIKE ME. SORRY BUT ITS TRUE. DUMB APP. ALSO THE ADS ARE SO ANNOYING. 3 TIMES I HAVE A HAD TO START FROM SCRATCH, I did not know why....then I realized.... OH IT ONLY ALLOWS 300 MESSAGES. DELETED. 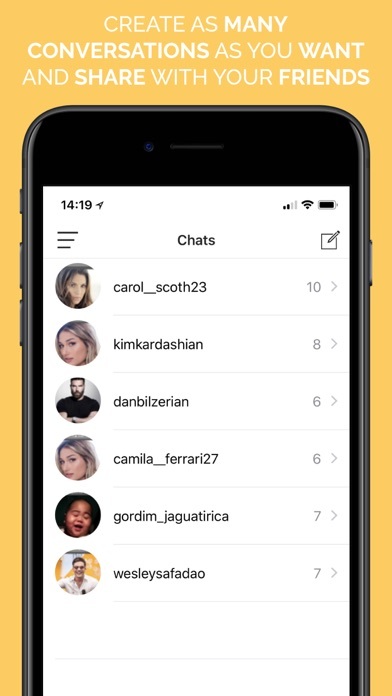 Love this app but how do I make a chat received? It does exactly what it says, and it is extremely easy to do! I also like how the ads don't pop up every 10 seconds like in other apps. Instead, there's about one every few minutes or so, which is totally fine!